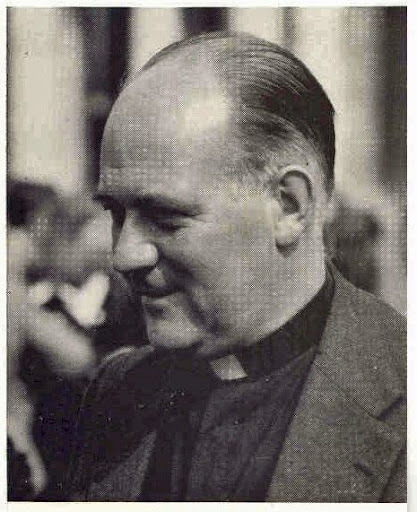 Fr Marcel Uylenbroeck was Cardijn's first successor as international chaplain of the International Young Christian Workers (IYCW) movement from 1965 - 1969. Born at Drogenbos near Brussels on 5 June 1920 and ordained in 1947, Fr Uylenbroeck became chaplain-general of the Flemish YCW (KAJ) in 1948. In 1959, he was named as adjoint international chaplain to the IYCW before succeeding Cardijn in 1965. In 1967, Pope Paul VI named him as the first secretary of the Pontifical Council for (of) the Laity. In 1972, he was named rector of Sint-Juliaan-der-Vlamingen, the Flemish church in Rome. In 1972, Fr Uylenbroeck was also named to the Pontifical Council for Migrants and Tourism. However, Monsignor Uylenbroeck was already suffering from the cancer that would soon take his life. Cardijn celebrates Mass during the 3rd International YCW World Council, Bangkok, November 1965, with Uylenbroeck at his side.